A striking new addition to our romaine lettuce lineup. Full-flavored, crispy deep-purple leaves sheathe an 8” stalk with a vibrant-red heart. Awakens salads with a jolt of color and flavor. 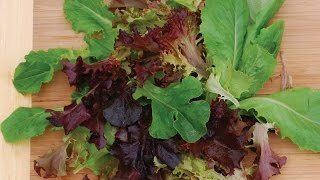 This lettuce is loaded with the antioxidant anthocyanin, which also accounts for the striking color. Good choice for the patio or kitchen garden. Lettuce, Ruby Glow is rated 2.7 out of 5 by 3. Rated 1 out of 5 by Aaron1995 from Ridiculous Price Average, store-bought tasting lettuce for a ridiculous price of almost 8 dollars a packet!! Burpee has always been my favorite company but their seed prices are getting ridiculous, they've been ridiculous. Lower the prices, or you lose me and i'm sure a lot of others. Rated 2 out of 5 by Marti53 from This was just like eating a red leaf lettuce. 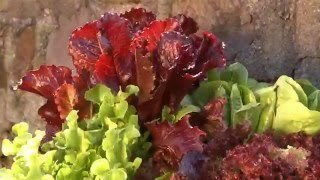 The plant never formed a head and the leaf was nothing like romaine lettuce. Rated 5 out of 5 by Oldlady from Best Garden Purchase This Season! Both great taste and beauty, combined with 100% germination, made this a winner in my garden and at the table. Other features include wonderful vigor and staying power - even in the heat (upper 80s to 90s most of the summer). The plants also experienced almost no insect damage, unlike other varieties I grew in the same corner of the garden. It was good enough to purchase three times this year...to be sure to have a packet for next season!